What is Raku Firing and how is it Done? Raku firing is an incredible ancient Japanese ceramics technique that has been used for centuries. Here’s how to use it in your work to create wonderful one-off pieces. The history of Raku dates as far back as the 16th century, and it was said that the special type of earthenware was first invented for a tea ceremony in Kyoto. Indeed Raku means ‘pleasure’ or ‘enjoyment.’ Traditional Raku pottery is also known to have been used by the Zen Buddhist masters who liked its simple naturalness. Traditionally the pieces are handmade not thrown. In essence, Raku is when pots are taken from the kiln while they are still glowing red hot, they are then placed in a material that would be able to catch fire, such as sawdust or newspaper easily. The reason for this is to starve the pot of oxygen, which gives the glaze a wonderful variety of colors. Pieces with no glaze on them take the oxygen from the clay itself, meaning some areas will have a matte black coloring. Raku differs to normal firing where the piece is removed from kiln after it’s cooled down slowly. For potters, it’s an incredibly exciting technique, as there’s always the anticipation of how each piece may turn out with so many different variables. The ancient Eastern styles of Raku were developed with new methods by American ceramicist Paul Soldner in the 1960s. The methods he created were known as ‘low-temperature salt firing,’ and he was known to teach his students ‘not to fight the unexpected but to look for the opportunities it offers.’ It has been said that ‘in firing Raku pots the chance effects caused by the interaction of combustible materials and hot glaze during the smoking process are a source of both beauty and excitement.’ Paul also believed that ‘mistake, rather than necessity, was the mother of invention.’ His ceramics are famous across the world. Western-style Raku firing differs from normal firing as it uses a low-fire method that means the ceramic piece is heated very quickly. The unpredictability of the outcome is something that attracts many potters to this method. 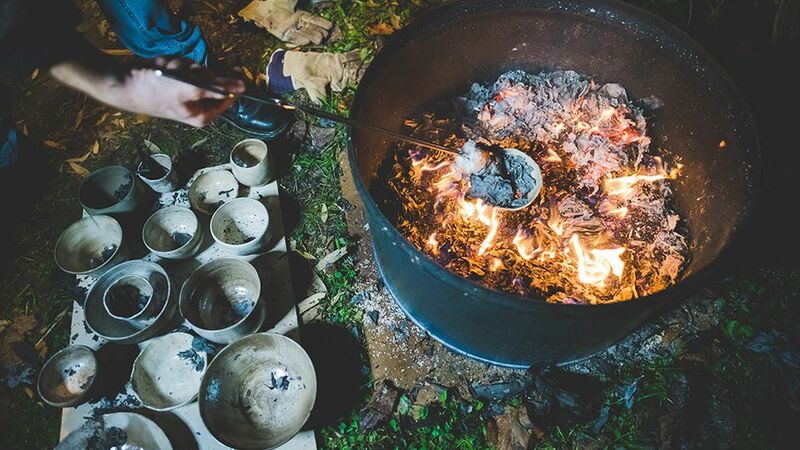 Typically western Raku is made from stoneware and heated to around 1,650 °F. Raku ceramics are loaded into a cold kiln, and the kiln is heated rapidly. Sometimes the cycles in which the pieces are fired are very short, as little as 15-20 minutes in cases, differing vastly to traditional firing cycles of around 10 hours. That is the similarity between Eastern and Western Raku firing; the difference is the next stage in the process. While Western firing has a post-firing reduction, Eastern firing has a rapid cooling in the open air or is often drenched in water. In Eastern Europe, there is another twist to the firing technique called Obvara. Here a concoction of yeast, flour, and water are mixed three days before the work is due to be fired. After the work has been biscuit fired, it’s taken out of the kiln dunked into the yeast mixture then plunged into the water. The steaming work should result in an interesting burnished surface when it’s finished. It should also be noted that there are not any Raku glazes as such; it is more the process of firing. Any glaze can be used for Raku. It can be dipped, sprayed or splashed on, all adding to the surprise at the end of the firing. Raku firing is vibrant and exciting but should be used predominately for decorative pieces. Although it was used for tea services in the 16th century, the process can increase the risk of flaking on the pots, meaning it’s not always food safe.